Looking for a tire rotation in Lethbridge? Put your vehicle in safe hands with Subaru of Lethbridge. 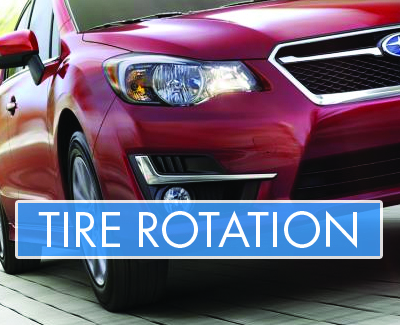 Guarantee the longevity of your tires with regular tire rotation and wheel balancing. Q: HOW OFTEN SHOULD I GET MY TIRES ROTATED? A: Your tire manufacturer will have a recommendation for how often you should rotate your tires. It's usually somewhere around 8,000 km to 13,000 km. Q: WHY DO I NEED MY TIRES ROTATED? A: Because the majority of vehicles have the engine in front, the front tires will bear more weight than the rear tires. Front-wheel drive vehicles have not only the engine but also the trans-axle in front, adding to the weight differential. Moreover, additional stress is placed disproportionately on the front tires by braking and steering. Thus, tire rotation needs to occur more frequently for front-wheel drive vehicles. Turning the vehicle will cause uneven tire wear. The outside, front tire is worn disproportionately. Even tire wear is desirable to extend the useful life of a set of tires.